Driving back on 395, a long, busy weekend. Finally almost home at 10PM (after leaving at 4AM on Friday), wearing my Army uniform and ready to see my parents and head to bed. But as I cleared the turn that brought me right past the Pentagon from the HOV lanes all of that popped from my head. Yes, it struck me... to see that flag there, in the foreground (not seen here) the lights representing those who lost their lives that day. In my hometown –Arlington, VA. The poor, brave souls on UAL Flight 93. As someone who has flown so often in my life, I have little trouble imagining the terror and confusion on the plane that morning. People just like me that were traveling for business or pleasure and expected the greatest inconvenience to be dealing with the cramped seats, bad food and delays of air travel, but instead faced a horrible situation where the passengers rose to the challenge to protect their country. 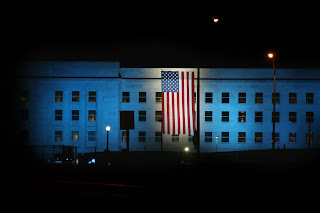 The civil servants, military personnel and contractors working in the bowels of the Pentagon to keep this country safe. Having been a contractor, serving as a National Guardsman and also being a civil servant, these were my people. My coworkers (in the grander scheme), comrades and peers who lost their lives in an unprecedented attack. And of course the lives lost in the WTC. I have lived in NYC, worked in the high-rises and consider it my second favorite US city. My family works there, my brother lives there.. Really, nothing can compare to the horror, terror and anger I felt at this violation and senseless loss of life that these attacks resulted in. So, yes I slowed (not safe I know but I did look and there was no traffic at all behind me), I felt myself finger the flag that sits on my right shoulder of my ACU's and tossed off a short salute as I drove past. 9/11 was one of the impetuous for me to join the Guard and driving past in uniform like that was fulfilling a promise of mine to not feel as helpless as I did 7 years ago. powerful words. thank you for your unselfish service to this country. i appreicate the kind comment on my blog as well.